Yufei Zhang grew up in Luoyang, a city in northern China. When she was a child, she was always excited when her grandfather came to visit. He would tell her Chinese folk stories such as the Goddess of the Moon, the Monkey King, and Dreams of the Red Chamber. The characters and the plots in these stories fascinated her. Yufei attended college in Hunan, a southern province in China. There she met Mark Salzman of Yale University who taught her English class. Mr. Salzman put his journey in China into a book called “Iron and Silk” which was later made into a movie. Interaction with Mr. Salzman and other Yale graduates intrigued her curiosity about life in foreign lands. In 1990 after graduating from college, ei came to America to study cell biology as a graduate student at Vanderbilt University. After acquisition of a master degree in science, she entered medical school at University of Tennessee to pursue a career in medicine. Four years later, she was awarded a M. D. and moved to Portland Oregon to start her practice as an internal medicine physician. Yufei’s experience as an immigrant in a foreign country enriched her life, similar to Mr. Salzman. Her journey from the east to the west heightened her desire to write down the stories from her past. Encouraged by her friend, an award winning author Jamie Read, Yufei finished her first screenplay: “The Scented Moon”. The love story is based on a Chinese legend and incorporates Yufei’s own experiences in America. 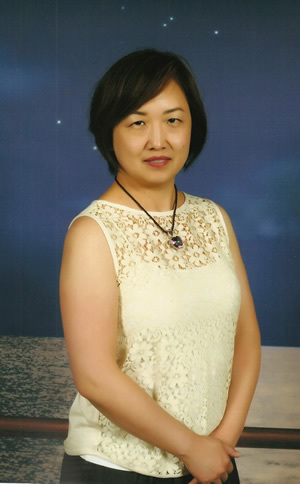 In addition to writing, Yufei enjoys reading and traveling. She lives with her teenage daughter in Lake Oswego, a beautiful suburban town outside Portland Oregon. Chang-Er, a young Chinese woman, hides her identity as the “Goddess of the Moon” who drank the elixir of immortality and lost her true love. She works as Dr. Belle Wang, an ER physician in Seattle. Shadowed by her past, she resists affection from any man until an Alaskan wildlife biologist helps her to find the courage to accept herself and move on, to her true destiny. Belle Wang, M.D., is no ordinary Chinese-American ER physician. Her beauty and grace attract men, whom she invariably rejects. She makes no friends, carries no cell phones. Every twenty years she relocates to a new place. She has a secret to guard: eternal youth. She is really Chang-Er, the young woman in the legend the “Goddess of the Moon”, who drank the elixir of immortality, left behind her husband and flew to the moon. In a remote village in China, Chang-Er was known for her beauty. She fell in love and married a brave hunter Hou-Yi who was gifted with godly strength. The fairytale life was envied by an evil woman Old Jade. Scarred by her own unfortunate experience, Old Jade tricked Chang-Er into believing that the only way to keep her marriage was to staying young and beautiful. Chang-Er asked Hou-Yi to seek the elixir of immortality. To please his wife, Hou-Yi went on a long and dangerous journey. His bravery and devotion was rewarded by a fairly godmother who gave him the elixir to share with his wife. Chang-Er caught Old Jade trying to steal the elixir and fought her. Chang-Er had to drink the elixir before it was lost during the struggle. The elixir turned Chang-Er into an immortal. Being accused of betrayal, Chang-Er left her village and went searching for more elixir. Three years later, she returned to her village empty-handed. She found out that husband had been killed in a battle fighting off the Mongolians. Heartbroken, Chang-Er swore that she would never love another man. She drifted in the world pondering the meaning of her existence, helping others as a healer. In her recent move, Dr. Belle Wang leaves the coast of Maine and comes to Seattle to work in the ER at Virginia Mason Hospital. She meets Kevin, an Alaskan wildlife biologist whose sharp instinct senses that Belle is unique. Upon accidental witness of her unnatural healing power, Kevin plans an investigation which he knows could be the most incredible discovery in science. Belle avoids Kevin, keeps a safe distance. Kevin realizes that Belle is actually tortured and wounded inside. His curiosity turns to sympathy, he desires to help her, but more, he falls in love with her. Belle agrees to accompany Kevin to his family vineyard in Washington. Feeling an intense attachment to Kevin, Belle starts to leave early. As she starts to go, she realizes a thick frost is descending, and threatens the entire crop of grapes. Belle stays to work with Kevin to try to save the vineyard from the disaster. As the frost sets in, Belle is forced to use her magical powers. Her true identity revealed, Belle disappears in a gust of wind. Forlorn, but with his family’s crop saved, Kevin returns to Alaska. He takes a vacuum jar to collect a sample from a glacier, and slips into a crevasse. Belle is alone in China, near the old battle ground. Torn and confused, she longs for the spirit of Hou-Yi. In the mist, coming from the ice at the edge of a mountain, she sees a figure of a man holding an elixir bottle. It’s Kevin: he’s Hou-Yi, the spirit of a mighty dragon. Chang-Er is home with Hou-Yi. Love finds a way to reward the ones deserving a second chance.